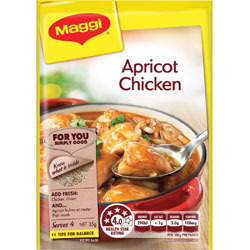 Feature MAGGI Apricot Chicken at your next Family dinner. MAGGI Recipe Bases make it easy to create healthy, balanced meals that taste great for you and your family. It's quick and easy! Palm Fat, Yeast Extract, Sugar, Flavour, Burnt Sugar Powder; Herbs: Parsley, Thyme; Spices: White Pepper, Coriander.